Sarah is a very warm caring wonderful person. She truly enjoys helping others and always puts others first even though many times putting her own needs aside. She loves being with people and being able to forget that she is a ROHHAD victim. 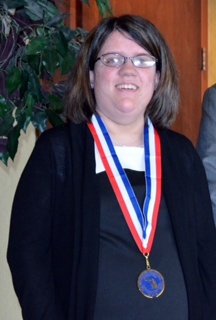 Sarah has 3 associate degrees and is currently a volunteer with the American Red Cross. She is an officer for the city library friends of the library organization. We all have learned so much from Sarah and admire her strength and positive attitude.